Large evergreen shrub or small tree with large leathery dark green leaves. 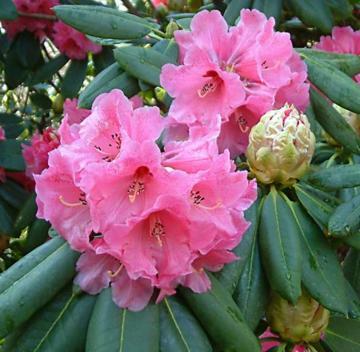 Very large trussess of bell shaped rich pink flowers, dark red spotted inside, opening from huge round buds. Flowers quite early in the season, from mid March. Hybrid of Rh. sutchuenense x Rh. thomsonii.